First beginning nearly twenty years ago as a PC-exclusive called The Longest Journey, players have been following the unique tale of parallel worlds of magic and modern industry, with events that link the two together. It wasn’t until 2006 that players were able to wet their appetite once more with a sequel (Dreamfall: The Longest Journey) and grow their relationship with those characters. Now, seventeen years since the journey’s first onset, the series makes its console debut with the release of Dreamfall Chapters, all five episodic stories tied together into one cohesive package. We’ve also interviewed Red Thread’s Founder and CEO Ragnar Tørnquist on the game’s development, in case you’re curious. Dreamfall Chapters consists of two ongoing stories of honor and humanity that couldn’t be farther apart from one another (plus one more of story significance that runs between). For the main heroine Zoë, her journey resides within a cyberpunk dystopia filled with political intrigue and machines that can lull the general populace into lucid dreams and melancholia. The other tale focuses on Kian, a disgraced Apostle that joins up with a resistance group filled with all manner of magical humanoids and Zhidlings. 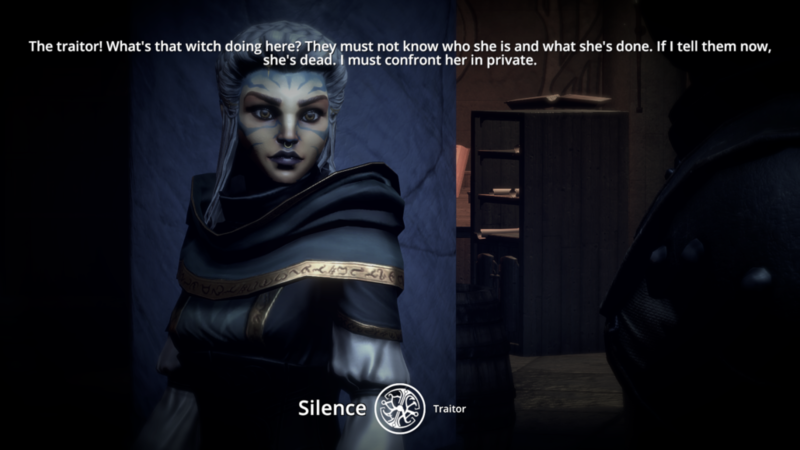 As a direct follow-up to Dreamfall: The Longest Journey, many of the character’s motivations might not be clear to the player without first brushing up on the story’s synopsis. The character writing in Dreamfall Chapters well exceeds what I have come to expect from the adventure genre and not only does it give life to the world, it also makes the characters far more believable. The idle banter between characters and the dialogue choices that present themselves each give the cast more life and reputability. 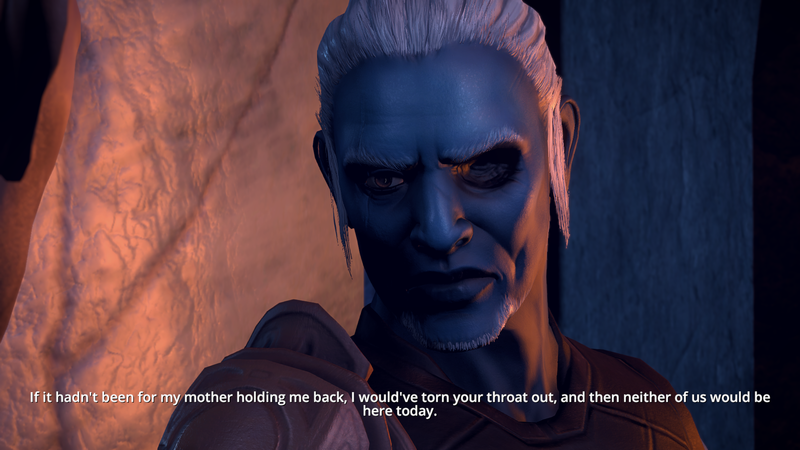 For as dull and monotone as Kian sounds in his side of the Dreamfall adventures, his counterparts, Enu in specific, help to liven up the setting with (often vulgar) banter between the heroes of the resistance. Player choice can be the biggest draw into story-driven adventure titles and the story to Dreamfall Chapters can easily be molded to the player’s whim. Even minor choices can steer the story in varying directions that can completely change the player’s motivations. One early choice gave Zoë the opportunity to designate her vocation in the early chapters, while not immediately present by the dialogue given at that time, that helped to build into how the player perceives Zoë and her motivations within the world. 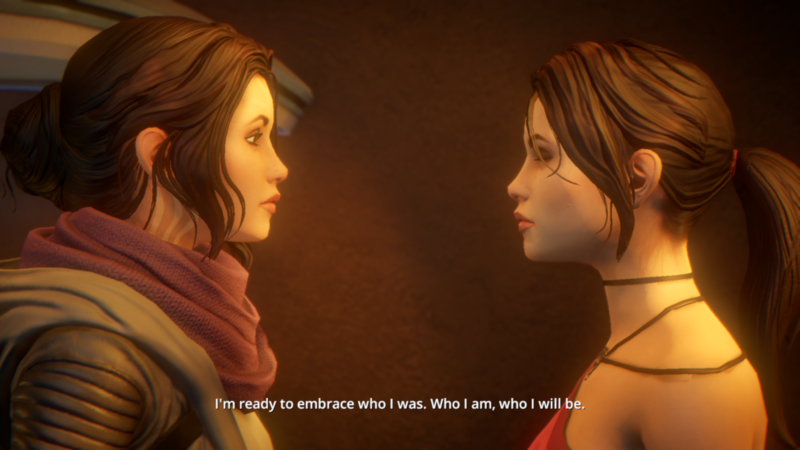 Taking a page from the recent playbook of Telltale stories, there is a transparency to the choices that the player makes throughout Dreamfall Chapters. An immediate feedback notifies players of a critical decision that can send rippling effects throughout the story, even for minor events that would change little more than flavor text in other adventures. Upon completion of each chapter, players are presented with a list of their most critical decision points and can compare their resolve against other players. One decision that I felt was aligned to Kian’s personal beliefs (which did result in a character’s death early on) wasn’t as well received by other players and I was shocked to see the support of less than ten percent of other players for that resolution. Where Dreamfall Chapters falls short is in its actual gameplay. Standing around and spinning yarns about daily life can be quite enjoyable, but when it comes time to step away and focus on the next objective, that immersion can be stripped away. In order to interact with the world and its colorful citizens, the player must move their cursor to highlight them in a contextual fashion that can be difficult to trigger unless the player stands in the right spot. I’ve overlooked a number of important pieces of evidence just by not standing in the right spot, an exercise that cost me quite a bit of time as it added up across my playthrough. Occasionally unresponsive controls and a subpar framerate can make even the briefest of sessions an exercise in patience. Zoë’s hometown is a notable offender, with the framerate dipping down to a sluggish single-digit at the oddest of times, even on the more powerful Playstation 4 Pro. Other scenes also equally suffer; for whatever reason, candles seem to have an awkward time rendering and can take a significant hit to the performance. 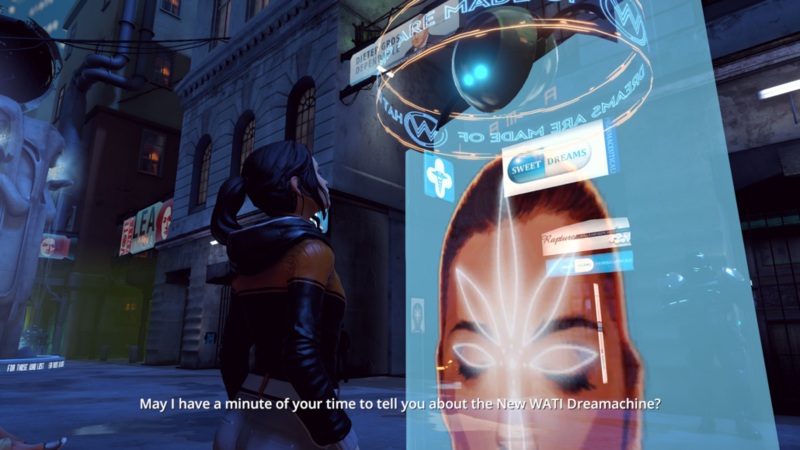 In most areas, the performance is quite serviceable, and while not amazing, shouldn’t be a detractor for those looking to invest themselves in seeing Dreamfall’s story wrap to a satisfying conclusion. For fans of The Longest Journey and Dreamfall, it’s been a bittersweet twenty years. Those who have been on that journey all this time will enjoy the chance to send those characters off one last time, although newcomers might only get to understand parts of the story. Cameos and past events fill out a majority of Dreamfall Chapter’s setting, but there’s still an entwined story beneath it all that can be enjoyed by newcomers nonetheless. Although the Unity port’s performance doesn’t handle particularly well under pressure on the Playstation 4 Pro, the journey is still worth taking just to see Kian and Zoë’s stories come to a close. Reviewed on PlayStation 4 (code provided by the publisher). You can buy it for PS4 via Amazon. Dreamfall Chapters is a satisfying conclusion to the nearly twenty-year saga along The Longest Journey. Even those fresh to the series can grow to appreciate the challenges that Kian and Zoë each face.